Georgia Steeplechase TRACK 120. Join today. Mark you calendars for the April 6th, 2019 Georgia Steeplechase. What is the Track 120 and how can YOU become a recognized founding member? The Georgia Steeplechase Track 120 is 120 members contributing $120 annually for the maintenance and improvement of the Kingston Downs track. Please see the list of Track 120 shown below. Weed and fire ant control, mowing, trimming and labor; Irrigation pump, diesel fuel, and irrigation system maintenance; Barn, rail, jockey house and tower maintenance; Fall aeration, re-seeding and fertilization; Fuel and maintenance for two 60 inch zero-turn mowers and additional landscape equipment, etc. The goal of the Track 120 Campaign is to raise $14,400 through 120 members contributing $120.00 annually. 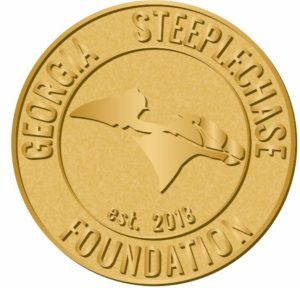 Members will receive the Georgia Steeplechase Foundation Pin, their name listed in the 2019 Race Program and on the website, and in email communications throughout the year. Join your fellow Track 120 members race day at the TOWER for a Champagne toast!!! Track 120 members will be continually updated and listed on the website. Join The Track 120 now.